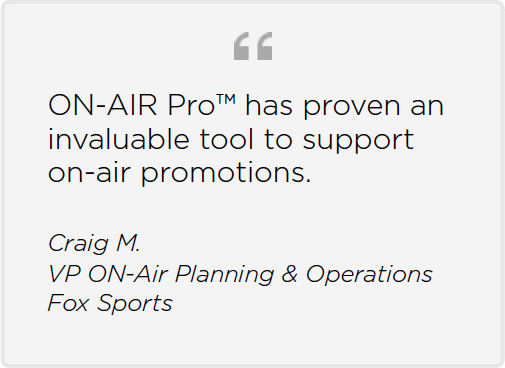 The ON-Air Scheduling™ plug-in for ON-AIR Pro™ is the answer for program planners and schedulers who have had work with Excel prior to committing their schedule to traffic. 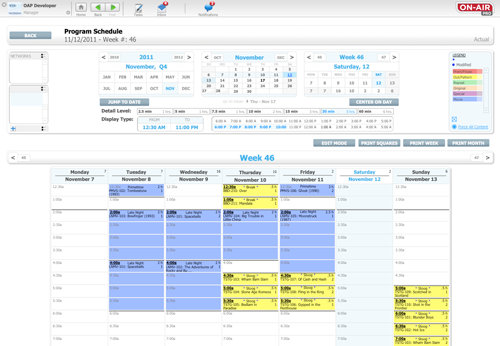 Programs can be scheduled directly within ON-AIR Pro’s visual grid, or imported through integration with 3rd party traffic or program scheduling systems. When integrated, it can provide a read-only view of the actual grid directly to the creative services staff producing material. Schedule changes are alerted, in real-time, to projects affected by a schedule change, so that staff can quickly adjust to the change. 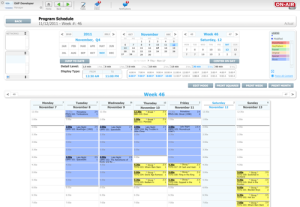 Our full-featured programming grids populate your time-slots and power dynamic schedules in just the way you need. Let ON-AIR Pro™ do the heavy lifting and leave the spreadsheets behind — all you have to do is lead the way. Build and populate color-coded programming grids. Track alternative schedules — even those of competitors. Discover erroneous or out-of-pattern programming automatically.